We began our day grabbing tickets at the Gateway Arch. If you plan to go on the weekend I would actually book ahead. The next ticket time wasn't for a few hours and they ended up selling out of tickets about half way through the day (we were there on a Wednesday). From there we meandered into a beautiful church right near the Arch. Leaving the church you see a sign pointing towards the Old Courthouse Museum. 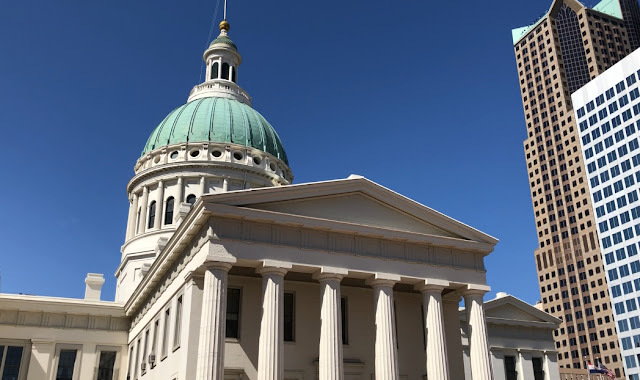 The Old Courthouse in St. Louis is not only structurally beautiful, but the museum inside it is completely free to visit. We walked through a couple of exhibits and then passed an information booth, where the lady informed us that her two favorite things to see in the city were the Gateway Arch and the City Museum. Y'all?! I about lost my ish!! I had completely forgotten the City Museum was in St. Louis. I have had that spot on my bucket list for years!! Poor Babe didn't even know what hit him. I quickly started working out how best to fit it all in. I basically told him, "sorry, you we are leaving all this history behind. You have to come play on this giant playground with me!" This place was EVERYTHING I had dreamed it would be and so much more! While it is called a museum it is really just this giant play structure made entirely out of recycled and salvaged materials. 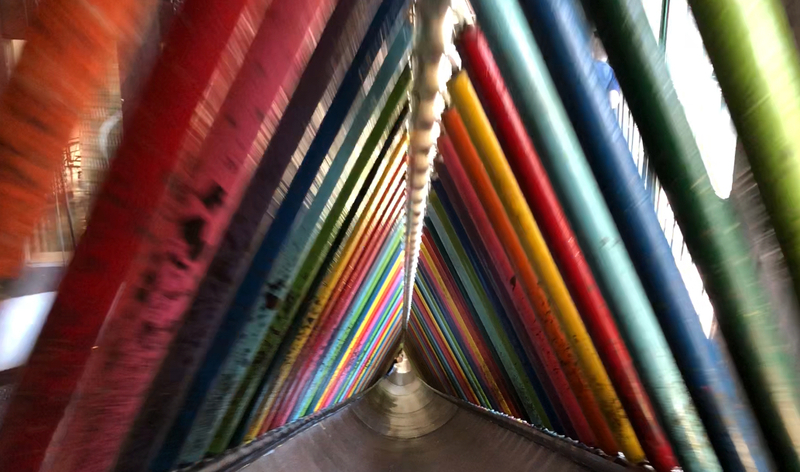 There is a slide that goes outside the building! There are maze like tunnels built out of anything from an old airplane to a firetruck. There are oddities all around and a slide that spans multiple floors! 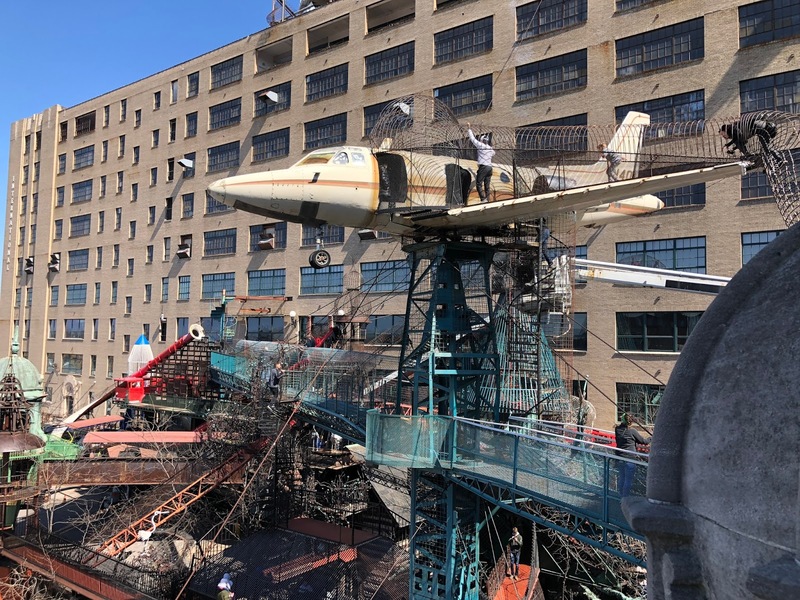 City Museum is NOT your average child's playground. I mean, we have no children; and while children would also enjoy it immensely, we saw plenty of other adults sans kiddos there. They even have a full bar on-site! Babe might have had to really squeeze his way through some of the tighter spots, but he did just fine and actually enjoyed it ALMOST as much as I did! Who needs lunch anyways?! We were so thankful to have been there midweek, because if it had been anymore crowded I don't think we would have fit in every slide in the hour time frame we gave ourselves. 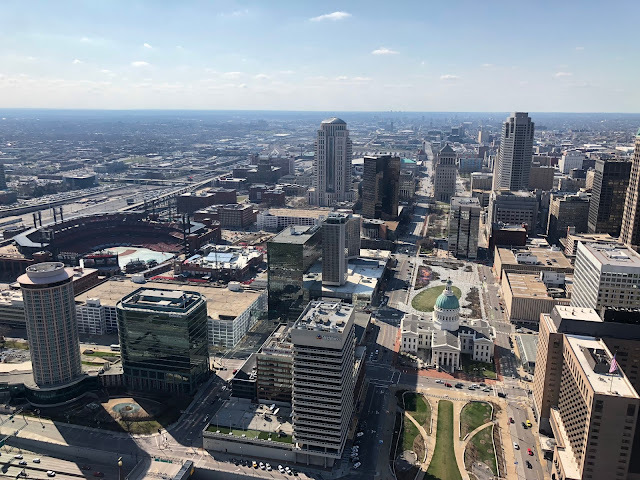 I could have stayed all day, but we had to make it back for our ticket time to the top of the arch (which I had actually gone and had changed so that we could make sure we made it to the City Museum). So, I hate to say this, but... I did not love Gateway Arch! I really wanted to love it and it really is very cool, and should be done at least once, but it is probably not something I will do again. Being a proud supporter of our National Park system I felt bad that it wasn't my favorite part of St. Louis, but after City Museum it was really going to be hard to compare. It is an amazing feat of engineering, but the whole process was just wayyyy too tight for me. The Gateway Arch is definitely not for the claustrophobic! 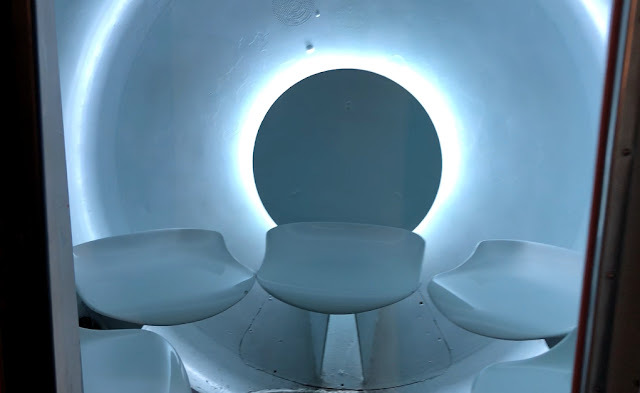 You first wait in a line (they ask you to be there 30 minutes before your scheduled ticket time, as the line can take a while) and then load up into groups of 5 to board these retro, spaceship looking pods, which take you on a 5 minute ride to the top of the arch. Once you leave your pod you assume things will be a little more spacious. There really aren't. Sure there is a bit more space, but you are sharing a tiny space with about 100 other people. The windows to look out of are very small and it feels like there is not enough air to support the amount of people filling the space. 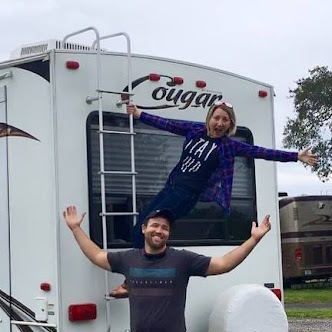 We did take a look out the window, but we basically got out of our pods (we actually rode up in separate ones because it allowed us to go up quicker than if we had waited to ride together) took one look at each other and said, "get in line, we have to get out of here". One of us then waited in line while the other took a look out the window. There are 8 pods fitting 5 people each. Thankfully we only had to wait through one turn around before we were able to head back down and enter out into the fresh air!! Ok, my claustrophobic ramblings are now over!! Really though, don't let this deter you- go, do, and then don't do again! Unless tight spaces and tons of people are your thing! Then do it all day long!! It ended up being a blessing that we didn't want to spend more time at the Gateway Arch. We were cutting it close for making the last tour time of the day (5:00pm) at Anheuser-Busch. We are really glad we didn't miss this! It's like touring Willy Wonka's Chocolate Factory, but for adults. 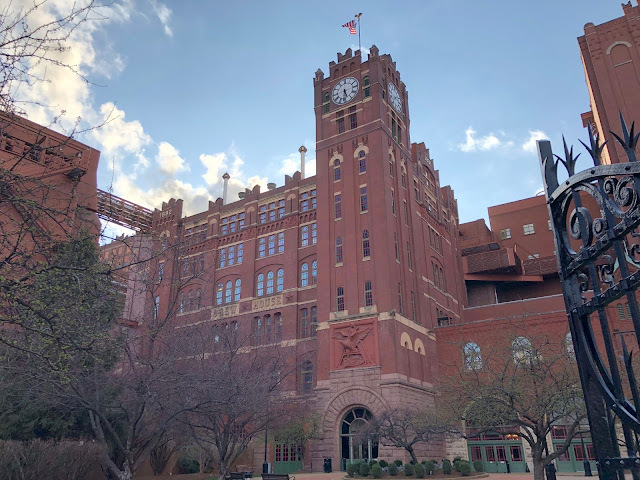 They have multiple brewery locations around the US, but Anheuser-Busch St. Louis is their largest and oldest brewery. The facilities were huge! We have done many brewery tours and this was by far the biggest, most history filled we've been on. Another perk?! 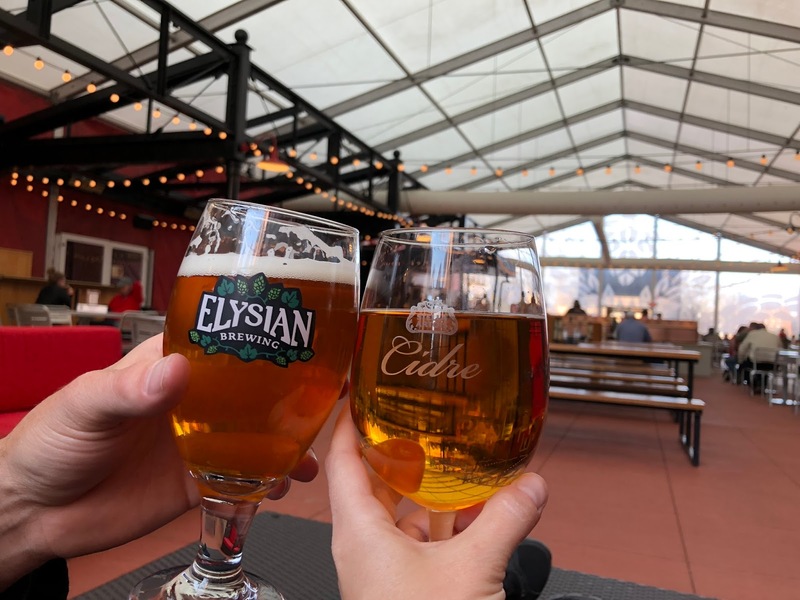 A whole pint of free beer to enjoy (you get to choose from whatever is on tap) in their biergarten. **They do serve food in the biergarten (which can be visited without going on a tour), so we did buy a meal. The food is really good and each meal incorporates some kind of sauce or dressing made with a specific beer. 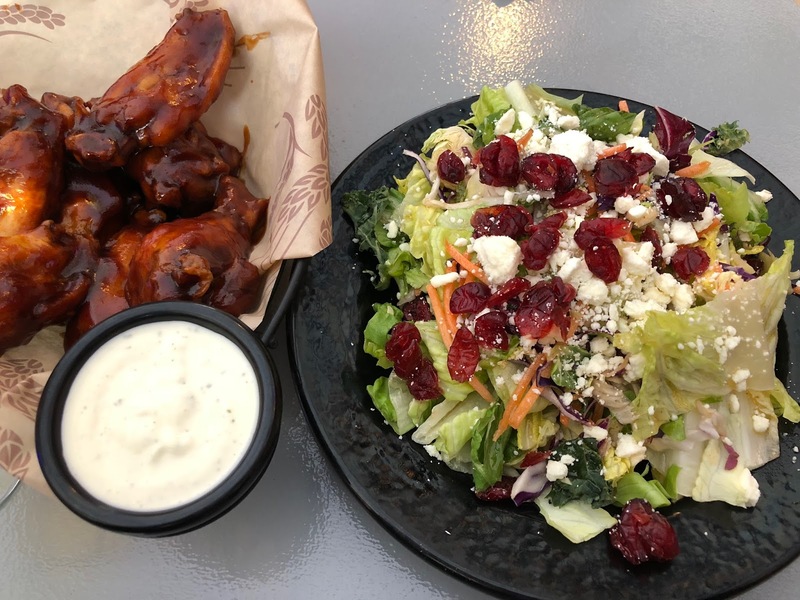 We got the bbq wings and their super green salad. So yum!! And that was the end to our day in St. Louis! Despite what seemed to be horrific tale of claustrophobic nightmares, we really did enjoy the entire day and our still very glad we did the Gateway Arch, because we always would have wondered!! 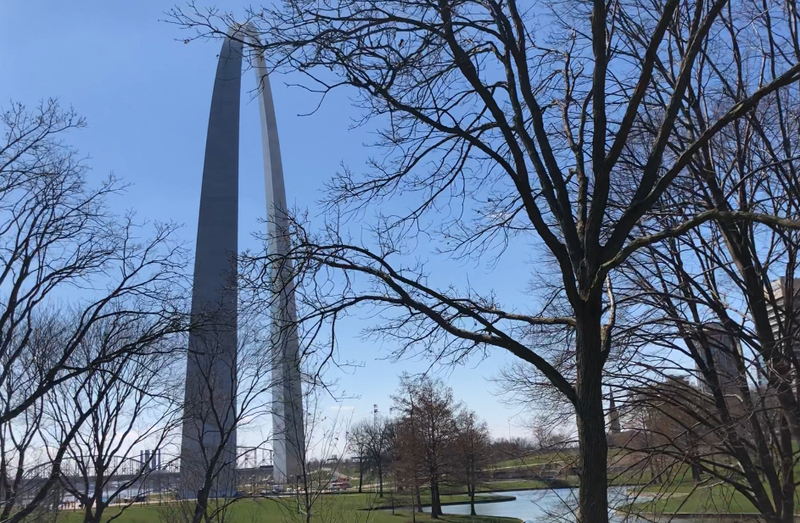 We really enjoyed the city and could have spent more time exploring, but if you only have a tight window of time then we think we fit in a pretty perfect day in the "Gateway to the West"! Have you ever been to St. Louis? Any spots you thought you would love that turned out not to be your favorite?! FUN! No, my Mom didn't sing that to me (want to meet your Mom one day - she's so cool) but you DO need to watch the movie! lol When we went through St. Louis, we didn't have time to stop and see the arch up close. I just wanted to touch it. :) That food y'all had though! Looks scrumptious! Haha- good ol' mom!! She is pretty fun! And I will take your word for it. Planning to watch it ASAP! The arch was definitely cool to look at! Supposedly some people will fall backwards if they stand directly underneath it and look straight up. We couldn't get directly under it (construction going on), but it does make your head spin a little even from the side! Woow you did tonnes in six hours! I'd totally be a fan of City Museum - no kids on tow but I reckon I'd have a blast there! Tried to fit in as much as we could :) City Museum is definitely worth a visit! Yes! 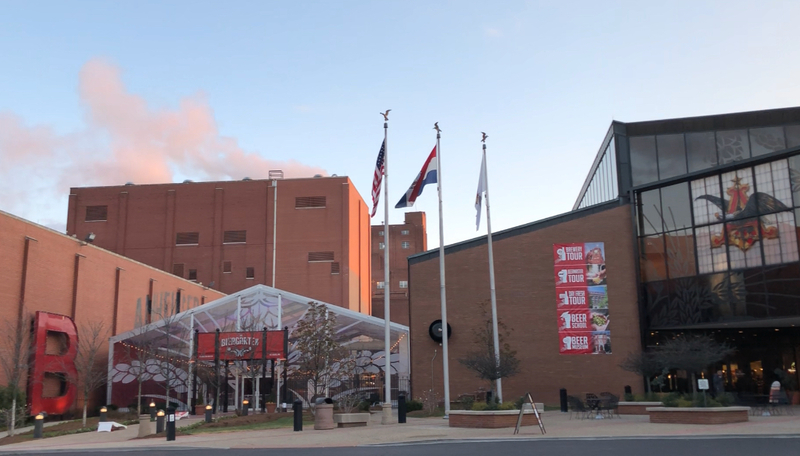 Go back for more beer and some added fun at City Museum! Haha, right?! Win-win for everyone!! My husband had been to the gateway arch. I always wanted to see it. Sounds like a lot of things to do. There is definitely tons to do in St. Louis! 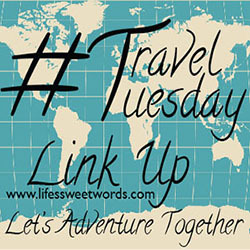 Maybe a fun little weekend getaway in in order?! I've heard from others that the Arch isn't their favorite sight in St. Louis. It looks like there are a lot of fun things to do there, though! I'd definitely love to visit sometime! Glad to know we aren't alone! We love our National Parks system, so I felt bad that I didn't love the Arch, but St. Louis is definitely still a super fun city to visit! I have always wanted to visit the Gateway Arch! BTW your video is so cool! Thanks Faith! Hope you get to visit someday! Ahh, we will definitely have to go back! Both for a game and the yummies!! If I ever visit St.Louis, the City Museum and Brewery Tour (hello free!) will be at the top of my list of to-do's. Thanks for sharing! You bet!! And yes, can't beat free!! Haha, mine grows daily! Sometimes by the hour! The old courthouse and brewery sound like fun! Probably wouldn’t like the gateway arch either though - I’m totally claustrophobic! It would definitely NOT be your thing then! Wayyyyy to crowded and tight!